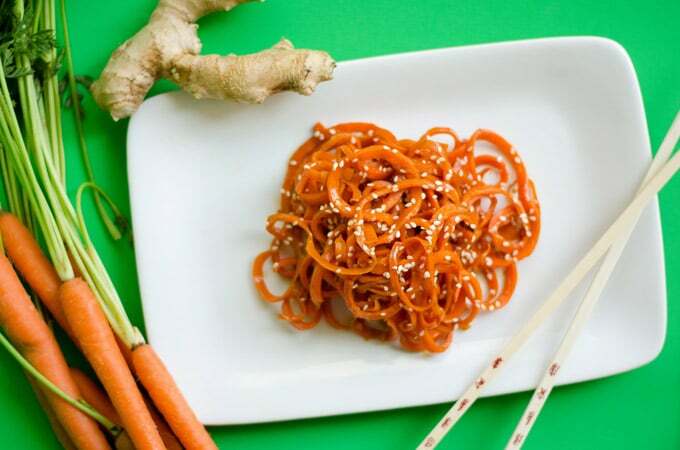 Quick and healthy Asian carrot noodles with a delicious combination of hoisin, soy, orange juice, and ginger! A unique and delicious low carb dinner. You know earlier this week when I was introducing carrots how I mentioned, in a roundabout sorta way, that the goal this week is to pretty much make carrots not taste like carrots? Because I really don’t like carrots? Well I’ve gone n’ done it. These carrots are so much more than the bitter, crunchy root they were destined to be. And it’s all thanks to some very magical sauces and flavors. Sesame Oil: This has always been on my “should probably learn something about” list, so I finally gave it a go. It’s a flavorful oil, almost nutty, and goes really well with the heap of other Asian flavors in this recipe. Hoisin Sauce: I’d never heard of this, but it’s by far the most magical. This pungent blend of soy, chile, garlic, sugar and sometimes vinegar or garlic brings a big Chinese punch of flavor. 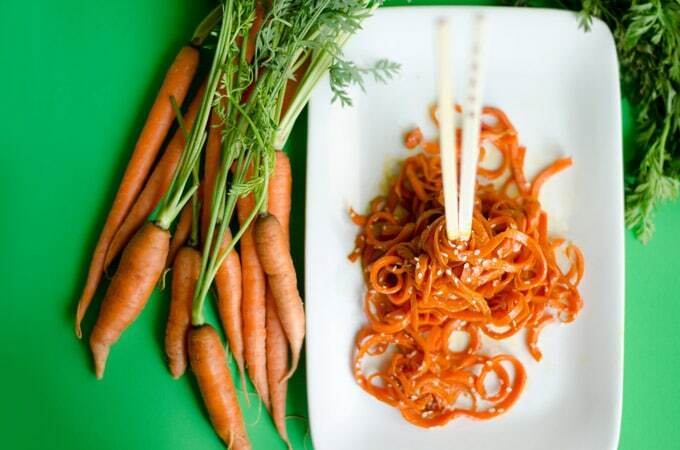 Soy Sauce: Something needs to bring the umami to these carrots, and soy sauce is it. Orange Juice: Just a dash does sweet citrus wonders! Ginger: Fresh grated ginger moderates the hoisin sauce a bit and is just sort of that missing piece of the puzzle. And the carrots? 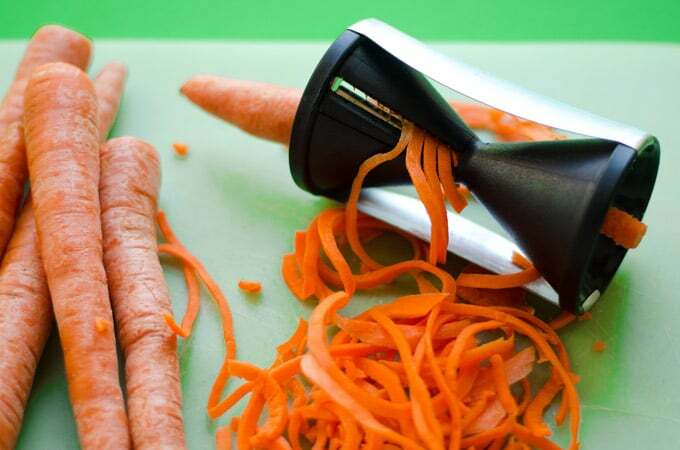 You’ll need either a vegetable spiralizer or a julienne peeler to get the distinct noodle cuts. 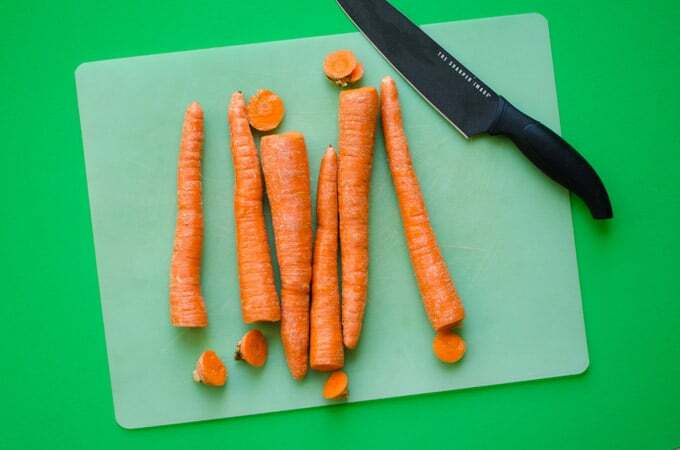 Throw some carrots into a pot of boiling water for about 30 seconds to soften them up a bit. 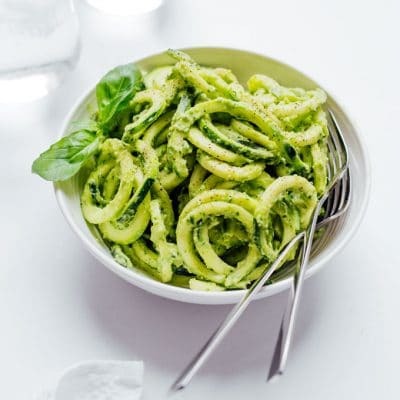 Let them cool just enough to handle, and spiralize away! Got a friend with strong forearms? Find them, use them. The constant pressure you need to maintain to get the long noodles takes a toll! 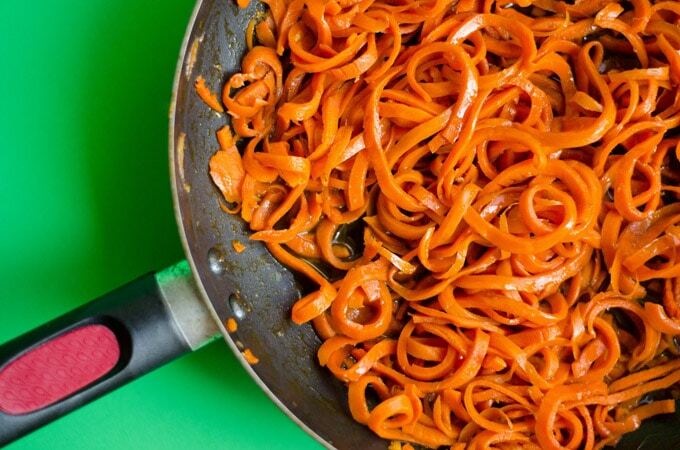 You’ve got your carrot noodles and your flavor makers. 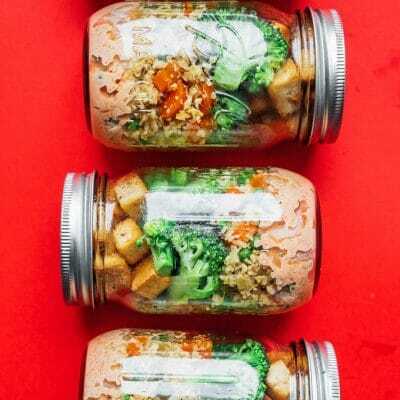 Stir fry it all together and you’re ready to eat! In a small bowl mix hoisin, soy, orange juice, and ginger. Bring a large pot of water to a boil. Add carrots to soften them slightly, about 30 seconds. Remove from water and let sit until cool enough to handle. Heat sesame oil in a large saute pan or a wok over medium heat. 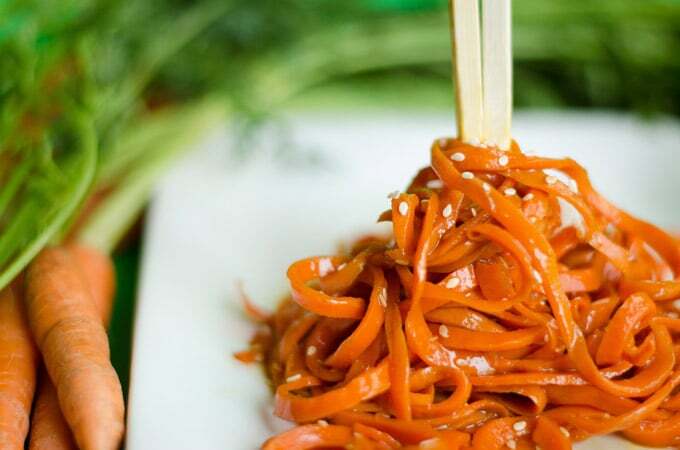 Add carrot noodles and cook about 3 minutes, stirring and flipping it all about like the true chef you are. Add in the sauce mixture and continue to cook another 3 minutes or so minutes, stirring to blend everything together. Sprinkle with sesame seeds and serve hot! No need to peel the carrots unless you feel like it. Just wash them well first. I’d had enough of an all-carrot diet (thanks to carrot week), so I threw in some grilled chicken. I bet this would be great with some grilled or marinated tofu as well! Hi there! 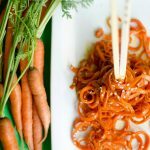 I use the Kitchen Supreme spiralizer for all of my spiraly recipes! I bought mine on Amazon here: http://amzn.to/1PnSB9l. It looks like it’s on sale right now too! 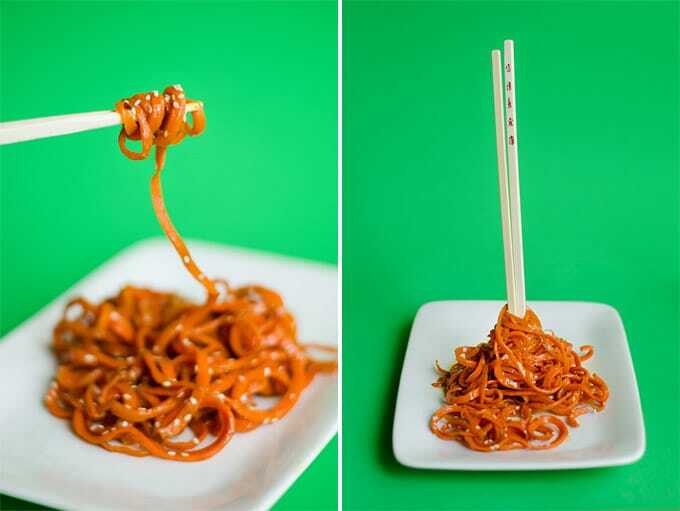 Can you post a section or library on veggie noodle options. 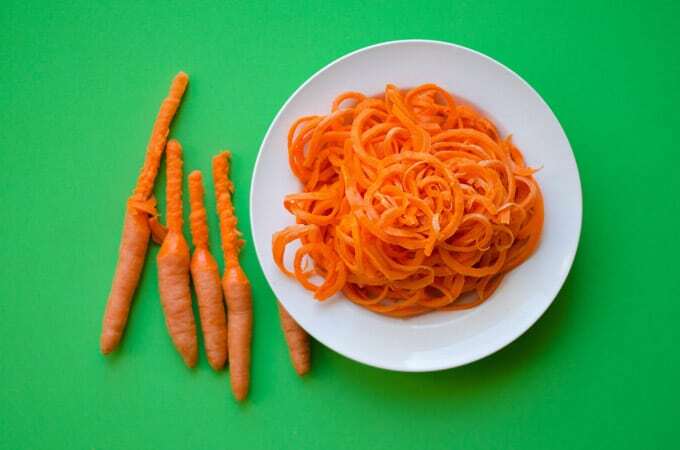 I see carrot and zucinni, but what else works? That’s a great idea! As I begin to make more spiralized dishes I’ll work some sort of library for them. But you can spiralize so much, especially with a good quality spiralizer, beets, squash, apples, potatoes. 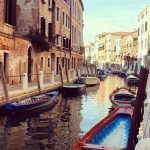 You can find inspiration at Inspiralized. I fixed this as a side with dinner this evening and my family raved about it. So delicious! Will have this again and again!!! We made these this evening with a little Spiral Slicer gadget I had just gotten and was using for the first time. We really liked this recipe, my daughter is picky but likes cooked carrots. Definitely going in the rotation. I was looking for something to have alongside Asian lettuce wraps. This worked well. Quick and delicious–and healthy. What more could you ask for?